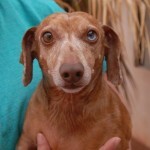 Kissing bandit!, cute Dachshund, neutered boy, 5 years. Please only consider Charlie if you like doggie kisses! 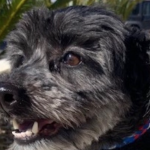 As one of the volunteers said, “Charlie steals hearts and takes no prisoners.” Charlie is reportedly housetrained, good with most dogs (but picky with some), and ready to plead with you for bites of human food.